I have been reading Atul Gawande’s The Checklist Manifesto. It is an entertaining and thought-provoking book. It really made me think about how better checklists in F1F9 can help us create better models and deliver an improved process for our clients. Gawande highlights the similarities between the surgical profession and two other complex, high-skill undertakings: the construction of large buildings and flying airplanes. While people working in construction and aviation depend on adherence to checklists to get things right, many doctors and nurses have not yet embraced this practice. Gawande makes a compelling case for the use of checklists in other professional fields, including business, investment decisions and the law. In the oil and gas industry, management rely on economic and financial analysis to make multibillion dollar investment decisions. Producing this analysis is not a trivial task. Analysts must consolidate and incorporate months or years of work by cross-functional teams. Years of knowledge, experience and organisational memory may be captured by a good checklist. All too often, our checklist of attributes is a model from a colleague that has just been floating around in the office. More and more companies are recognising the risks associated with modelling, and are realising that the cost of an inefficient, ad hoc approach is too great to bear. Our latest ebook "The oil & gas modelling checklist" delivers a comprehensive checklist and supporting ebook which takes you through some of these risks. I qualified as an ACA back in 2002 and have regularly been that guy ever since. You know the one, newly arrived Accountant / FP&A / FC / Finance Manager / FD. First few days in the job and boom – the problems i've inherited become painfully clear. No or little handover (here’s where its filed, good luck, bye), an Excel model for Consolidation / Management reporting / Regulatory reporting / Board pack / Investment valuation / New service proposition evaluation / Pricing etc.. It was a jumble sale of functions, formats, sources, hard-coded adjustments, assumptions and dates. Here come a few days of head scratching and ‘bleeding’ eyes as I try to pick my way through the labyrinth, using what bread crumb trail remained. Inherit or start over? In my experience, half and half. Then I met the founders of F1F9, who also happened to have a big hand in developing the FAST Standard. They were looking for someone to lead the Enterprise Reporting & Analysis practice and I had been recommended to them. Within 5 minutes I got it. A best practice standard in financial modelling. Genius! Learn the standard, master the techniques and methodology, build spreadsheets that spread a sense of calm with their transparency, flexibility and simplicity. Models built for collaboration. A few days of FAST and even reviewing the models is easy. It’s a game changer and in the last few weeks the ICAEW have recognised FAST as the only standard to currently comply with their guidance. My journey along the path to enlightenment started with the free 31 day course – take a look and see if it can help you. Guest post from Bert Verstraete – Rebel Group. In a recent blog post, F1F9’s Andrew Berkley raised the question: "What if my existing model isn't FAST?" Andrew proposed a model rebuild as being the most efficient solution. But for me, this is not the only answer. Over the last few months, I introduced some (graduated) engineers into the world of economics. For the first time they heard words like: debt, equity and internal rate of return. At the end of the course, they were asked to make a business plan. To help them, I gave them a very small Excel file. They could use this to draw up some figures and statements (making sure to apply the FAST standard of course!). Even though they were all convinced about the appropriateness of FAST, one student decided to create his own model. I didn’t think this was a problem. Had it been a FAST model, the issue would have been spotted quickly. After 10 minutes, running through his small model we found what was going wrong. Everything was in the model, except for taxes. He had no idea how to model the carry forward of taxes. And there, I could help him with my FAST model. I gave him my tax calculations from my FAST model. I told him to replace some of my rows with the results of his earnings before tax computation. We then look at the result: the taxes he wanted to calculate. And so we found a solution and a new believer in FAST modelling. Rebuilding an entire non FAST model is not always the best answer. Sometimes you can adapt a non FAST model with a FAST solution. This won’t solve all issues, but it is a step in the right direction. Last week in London the Institute of Chartered Accountants in England and Wales (ICAEW) launched their Twenty principles for good spreadsheet practice. In this document the ICAEW recommend that organisations adopt a standard. As one of the member firms of the FAST Standard Organisation were delighted that the ICAEW also officially recognised the FAST Standard in their document. This short film, sponsored by the FAST Standard Organisation, gives you an overview of the event and an introduction to the ICAEW principles. The ICAEW made this statement on their website, "Businesses of all shapes and sizes are very heavy users of spreadsheets, and in some cases key business decisions costing millions of pounds rest on spreadsheet modelling. Yet studies suggest that 90% of them contain mistakes. It isn’t just the headline-grabbing high profile errors. Smaller businesses also lose money, not only through errors but also through sheer inefficiency caused by poorly designed spreadsheets that lack such basics as integrity checks and documentation. Use of these principles will help organisations reduce risk and improve efficiency of spreadsheet use, saving valuable time and money." 1. Determine what role spreadsheets play in your business, and plan your spreadsheet standards and processes accordingly. 2. Adopt a standard for your organisation and stick to it. 3. Ensure that everyone involved in the creation or use of spreadsheets has an appropriate level of knowledge and competence. 4. Work collaboratively, share ownership, peer review. 5. Before starting, satisfy yourself that a spreadsheet is the appropriate tool for the job. 6. Identify the audience. If a spreadsheet is intended to be understood and used by others, the design should facilitate this. 7. Include an ‘About’ or ‘Welcome’ sheet to document the spreadsheet. 9. Focus on the required outputs. 10. Separate and clearly identify inputs, workings and outputs. 11. Be consistent in structure. 12. Be consistent in the use of formulae. 13. Keep formulae short and simple. 14. Never embed in a formula anything that might change or need to be changed. 15. Perform a calculation once and then refer back to that calculation. 16. Avoid using advanced features where simpler features could achieve the same result. 17. Have a system of backup and version control, which should be applied consistently within an organisation. 18. Rigorously test the workbook. 19. Build in checks, controls and alerts from the outset and during the course of spreadsheet design. 20. Protect parts of the workbook that are not supposed to be changed by users. We are delighted that the FAST Standard has received this recognition and hope you enjoy our coverage of the event. To download our How to standardise modelling ebook, click the link below. What if my existing model isn't FAST? It's one of the most common challenges in the classroom: "Andrew - what you are teaching us is all very well for new models. But I work with models that have not been built to a standard. What should I do with them?" Nobody likes my answer - which is to rebuild the model using a modelling standard. "I just wanted to let you know that last week I was asked to review a business model received from an external party. It was not that good, so I decided to remodel the model using the FAST rules we learnt during our course, in the Excel template provided. And I must say: my colleagues and I were quite surprised with the result. It gave a clear and easy-to-understand model with an accurate result. "We are definitely going further with this in the future I think." And it's not only this company that is going further with standardised models. The Institute of Chartered Accountants in England & Wales is launching its Twenty Principles for Good Spreadsheet Practice on June 17th 2014. High on the list of principles is: adopt a standard - and stick to it. Why is it that in 2014 we are still talking about spreadsheet errors as if they were inevitable? This week's high profile spreadheet story was the FT’s savaging of Thomas Piketty. These errors have raised questions around Piketty’s (until now) widely praised conclusions, regarding the rising wealth inequality in the US and Europe. Felienne Hermans' blog - Felienne Hermans is an assistant professor at Delft University of Technology and her attitude is “only a fool blames their tool”. Whilst spreadsheets are very close to her heart – she has a wider view about programming and software engineering methods. In my opinion the spreadsheet blunders that are mentioned in the news are as a result of a lack of respect for the tool of choice (the spreadsheet). To look at this a slightly differently, it is like an average person like me, who has no building skills, looking at a house and thinking “I could build that”, simply because I have the right materials. If you don’t have an understanding (or even awareness) of the basic principles and standards for building a house, then it will not work. You might not realise there is a mistake, but that house will always be fundamentally flawed and dangerous. But as so many spreadsheet errors have shown, a poorly built model doesn’t always fall apart in the same way a poorly built house may. The mistakes can remain hidden until someone with an understanding of the standards takes a look, then the mistakes appear glaringly obvious. Themodelauditor blog points readers towards the ICAEW’s twenty principles for good spreadsheet practice. This is due to be launched formally launched on the 17th June in London. Principle number 2 in this document, is “Adopt a standard for your organisation and stick to it”. We’ve been talking about this for some time and we’re delighted that a body such as the ICAEW is clarifying its advice on this. At F1F9 we use the FAST Standard. This helps us to ensure that any errors that do exist (and they will) are more easily spotted. Until standards are embraced within spreadsheet use, mistakes will continue to occur and the hard work that has been put into developing hypotheses and conclusions will be undermined by simple errors that could have been avoided. Almost a year ago we highlighted what happens when spreadsheets go wrong, with our dirty dozen ebook – take a look and tell us if you think that Piketty should be added to make this a baker’s dozen. Guest post by Karen Tait-Lane. Karen is an experienced procurement and project management specialist who helps businesses and third sector organisations win competitive tenders and implement their projects. For more information and to contact her directly, visit www.tait-lane.com. I am an ex architect and relatively new to the world of financial modelling. I recently downloaded F1F9’s ebook – 10 principles of Agile modelling. Following this I was both surprised and enlightened. As an architect, design and effective project management are essential to the success of the role. I was surprised that financial modellers have, it appears, not understood that there is an inherent design process when constructing models, but preferred instead to view it as a purely linear project management process. This approach can be rigid, limiting and can increase the risk of a poor solution. I believe there are lessons to be learned from the design professions. Good designers know that the most important stage of a project is at the start, before decisions are fixed. Careful preparation, combined with adequate time, allows the greatest opportunity to add value and reduce the risk of trouble at the end, where, late changes in the construction stage, do contribute to cost escalation. In practice, architects / designers avoid final specifications for as a long as possible, preferring to keep to outline / drafts to encourage stakeholders to continue contributing to the design development as an iterative process. This is not to suggest that there should be a lack of structure, but instead, a unifying objective for the different contributing disciplines, supported by a review process to test proposed solutions against that objective. Architects are trained to challenge the status quo, achieve the best solution and not to be precious and protective about a proposed solution; the more this occurs at the early stages of a project, the smaller the risk of expensive changes or errors during the construction. As financial modelling requires multi disciplinary input and, in certain instances, across organisation review, I am also surprised that a standard approach is not a fundamental. Without these standardised factors, quality is placed at risk and costs can escalate. This happens through delays, errors, abortive work arising from inappropriate, insufficient, missing, or unclear information and poorly presented work. Can you see any parallels? This was brought home to me recently when I inherited an appalling, over complex, and, frankly untidy series of spreadsheets which I was required to understand in a short time frame. It was not only a frustrating, but also an undermining experience. The eventual outcome was that the long formulae and messy set up hid several major errors, the process increased resource costs, delayed reporting and ultimately provided less business savings than previously identified to the CFO. A further parallel to construction arises from the Agile Principles of partnering; the collaborative approach to project management which encourages value add and continuous improvement. This approach was encouraged by Egan some 15 years ago in the construction industry with a similar aim of improving quality, reducing waste and cost. I have found this approach core to a project's success and a far more satisfying working arrangement, with all members of the team treated as equals and where open and regular discussion is encouraged with the aim of improving the proposed solution for the benefit of all. 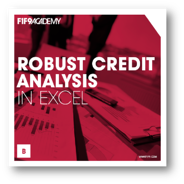 On May 8th 2014 we held the "Debt Sizing in Excel" webinar. Over 800 people registered for the event. If you missed it, you can watch the webinar by clicking here. During the the webinar we had a lot of questions about the model and the methods we were presenting. We tried to get through as many of the questions as possible during the webinar, the ones we didn't have time for are below. I hope you find them useful. If you have any other questions please feel free to post them below. Q: Fiona, could you show with 1-2 examples the flow of how the after-tax debt discount rate has been varying year to year over the maturity? A: We recommend that you take a look at the calculations in Debt! Row 49. The calculations for how we have varied the after tax discount year by year are set out there. You will see in the model how our period calculations are based on the relevant forward rates. Q: Is this method also applicable for Project finance transactions? I think then one should use the cashflow waterfall approach to get to CFADS. A: A cash flow waterfall approach could also be used to arrive at CFADS. What's important is that CFADS is post tax and pre financing. Q: Can you please discuss what discount rates are used for the CFADS/Sustainable CFADS approaches? And what is the rationale behind those rates? (ii) a margin for corporate credit risk. (ii) the tax relief on interest payments. The higher the debt investor's rate of return; the lower the total debt capacity. But an increase in tax rate would, all other things being equal, increase total debt capacity. Q: When using the PPMT function to calculate a simple mortgage style repayment profile, the PPMT needs a constant rate over the duration of the loan otherwise it will not repay – what interest rate would you use if the actual base rate + margin are changing? What if there are different layers of senior debt (pari-pasu)? e.g. Tranche 1 Export Credit Agency, Tranche 2 Commercial banks etc. How do you allocate the principal repayment to different tranches? A: It is possible to use the PPMT to calculate this period's principal repayment but considering remaining debt repayment periods - along the lines of PPMT (periodic rate, 1, remaining debt periods, principal outstanding). (ii) Principal repayments to zero by changing the constant debt service. We will publish a financial modelling handbook guide on this in due course. Q: Please can you briefly explain what "value gained from interest tax shield" means? A: Interest is deductible against pre-tax profits. This means that the company's tax bill is reduced because of the interest charge. Dividends, on the other hand are paid from after-tax profits and do not carry this 'tax break'. Its is known as the 'interest tax shield'. The result is that having debt in the balance sheet results in a value gain from the interest tax shield. However, this gain is only available to the extent that the value of the tax shield is greater than the rising costs of both debt and equity as the company takes on more leverage. On the power point slide showing the WACC curve, the point of inflection on this curve (where the WACC is at its lowest point - and the company is maximising the value from the interest tax shield), is achieved at different levels for different industry sectors. If a company has low business risk, it can usually gain more from the interest tax shield because it can access more debt proportionately and at better rates to finance the assets, than companies with high business risks. Q: Is the maximum debt capacity equivalent to 1x ratio in previous method? A: No. Because we are using no growth cash flows to calculate the sustainable cash flows (Approach 2) whereas Approach 1 (Discounting of actual forecast CFADS method) uses the actual growth cash flows projected under the business plan. If we used a 1x ratio for Approach 1, then we would overestimate the senior interest bearing debt capacity. Also there would be no cash flows left over for the equity capital providers. Q: Why is it that in PF transactions, higher leverage is preferred? Specifically considering the WACC explanation showing that the optimal solution lies close to 50/50 D/E. A: Regarding the WACC explanation on the power point showing the optimal solution lies close to 50/50. Here we are making a generalisation. Across business sectors, on average, mostly 50/50 D/E in market value terms will be around where the optimal capital structure point will be. But this is a very broad generalisation. For the case company we used on the webinar, their business risks are higher than the average firm and so the optimal point is reached at lower levels of debt/equity. The optimal point is achieved at different D/E proportions for different industry sectors. If a company has low business risk, it can usually gain more from the interest tax shield because it can access more debt proportionately and at better rates to finance the assets than companies with high business risks. Q: In method 3, why is £68m the optimum point? 1/1.3, 76% - still seems quite high for a "high risk forecast ... ? A: The company is moderately high risk rather than high risk. This is because it is not in a cyclical sector particularly - producing low margin household cleaning products and personal care products. So there is reasonable underlying stability to the revenues. Also historically margins achieved are not too erratic for this firm. So although capex needs are high and it has relatively high fixed operational costs, the risks are considered moderate to high. We assess this from the analysis of the sensitivity of the cash flow to the key cash drivers. We track this over time and vs. comparable companies to sense check too. At the end of the analysis, there is always some element of subjective judgement and there may be some bankers who would consider a higher coverage. So, in conclusion, the 1.3 x coverage takes into consideration the historic volatility of key cash drivers as well as our view on these going forward. This would mean that the senior lenders would have a reasonable expectation of repayment in full within the time frame proposed based on typical volatilities of key cash drivers at the 1.3 coverage level. Q: Please provide detailed calculation and assumptions behind Beta calculation. A: The detailed calculations and assumptions behind the Beta figure are done by our data provider - Thomson Reuters. Their beta is based on the Capital Asset Pricing Model. A linear regression model is used to assess the stock price of the firm vs. the market. The Beta denotes the firm's systematic risk proportionate to the systematic risk of the general market or index used. Company specific risks (which are not measured by Beta) are taken into consideration in the calculation of the company's operational cash flows. Q: Have you applied any of these methods to very small private companies? My space includes revenues under $5 million, where levels of sophistication are a lot less than what was presented today. A: The methods we use for very small private companies are approaches 1 and 2, based on discounting for forecast CFADS. This translates well into small companies. Q: How did you choose the present value factor for the sustainable CF method? A: The PV factor is calculated from two things - first the number of years or periods away the cash flow occurs, second the companies long term cost of debt after tax. So PV = PMT/1+r^n where n is the number of periods away the cash flow occurs and r is the long term cost of borrowing after tax. However there is a little more to say on this as, in our model, we have not used a single rate for throughout the forecast period. Our calculation for r is calculated from the forward rates and therefore reflects anticipated rising interest costs based on the current outlook. Please take a look at the calculations for the PV factor in the actual model and let us know if you have any further questions. We would be please to provide more information if required. Q: Which method is the most common approach and most widely used in the market. Given that mid corporates are unlikely to be graded the third method may not be as relevant. I am asking mostly in the context of PF. A: We agree that method 3 works best for graded companies, although implied ratings can be derived as shown in the model for non-graded companies. However in all cases, our recommendation is to focus on Approach 1 and 2 for the practical debt sizing. Approach 3 is something to would really only spend time modelling and analysing for large companies in developed capital markets where the corporate bond market is deep and active across the credit grades. 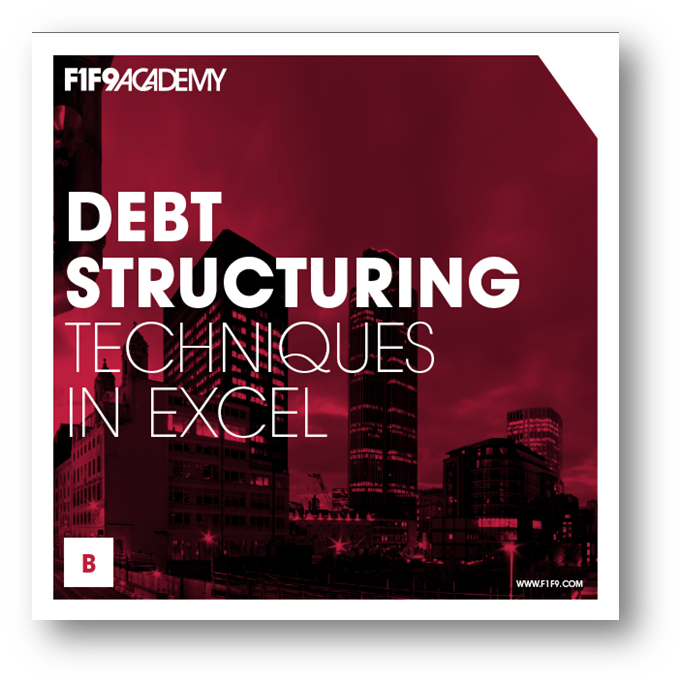 The emphasis on modelling and teaching in our Debt Structuring course is on Approaches 1 and 2. Q: Is the add back of Depreciation and Amortisation only relating to Maintenance CAPEX? A: We can use the depreciation figure as a proxy for maintenance CAPEX. For many companies this works reasonably well, however, not for all companies / situations. It depends where the company is in its CAPEX cycle - maybe they have recently invested heavily in modernisation and maintenance capex going forward will be lower than depreciation, or, alternatively, they may have underinvested for a number of years prior, in which case maintenance capex needs will be higher than the depreciation figure. Q: Why do we need to adjust the cost of debt with the tax rate? Will it not be more prudent to have higher discount rate? Or take the cash flow after tax to be more precise? A: We need to make a choice as to where to bring the tax break on debt into the analysis. Choice 1 would be to bring this into the cash flow - as you say: take the cash flow after tax . Choice 2 would be to bring the tax break into the discount rate. Our preference (and that of most practitioners) is to bring the tax break into the discount rate. This means that we calculate operational cash flows without any impact from the financing decision, then we can separately consider how to finance those operational cash flows. In conducting the debt capacity calculation we recommend choice 2 - i.e. to use the after tax (or true) cost of borrowing to the firm. Q: Why do you use MV(Eq)/sum(MVeq,MVdebt) for WACC weight instead of Volume(Eq)/sum(VolEq,VolDebt)? A: We use market values rather than volume. Most practitioners and academics recommend the use of market values for the WACC formula. So for equity market value this is volume of shares * share price. For debt we can either use the book value (the norm for small companies unless they are in financial distress) or market value when considering larger firms that have publicly traded bonds outstanding. For large companies with publicly traded bonds outstanding, we look at the Yileld to Maturity (YTM) that bond investors require today for investing in the company's long term bonds and apply that yield to derive the present value (PV) of their current debt based on the firms current interest expense figure. But this latter approach only really translates well for large companies. It is fine to use book value for anything other than the largest companies with publicly traded bonds outstanding for the debt weighting in the WACC calculation. Q: Is expected equity return factored into this maximum debt size estimation approach? A: With Approach 2 - the discounting of sustainable CFADS, because we are looking at no growth sustainable cash flows, the implication is that any growth in the cash flows above the sustainable cash flow level will belong to the Equity investors. For this reason we do not factor in any suggested equity return in to the sustainable cash flow discount rate. Whereas, in contrast, when we work with actual growth cash flows under Approach 1, by applying a DSCR (Debt Service Cover Ratio), e.g. of 1.3, the implication is that it is the 0.3 part of the coverage ratio that goes to the equity investors. Q: In project financing, the optimal debt : equity is 70:30, which is absolutely opposite. A: With project finance it is often possible to reduce the risk of the projects operational cash flows through offtake agreements, throughput agreements, and via various forms of derivative contracts. There are often a range of contingent support arrangements in place from third parties or from project sponsors. This makes the project's cash flows more certain / less risky. For this reason the debt capacity is higher (e.g. on Approach 1 we take a lower DSCR than 1.3 for the case company.) and this will result in higher D/E levels in most project financings. We currently offer two banking related training courses - click the images below to find out more. We have now published more than 20 modelling guides by 12 different contributors. Over the past 5 months these have been viewed over 10,000 times on slideshare and downloaded more than 3,000 times. It's a good start, but it's just a start. We aim to publish a handbook guide once a week - to receive our regular handbook notifications, please sign up below. Below is an infographic we created to showcase the achievements of the last 5 months.